All attendees, including those representing sponsors, must have their own tickets. All sponsorship packages include at least one complimentary ticket, but please ensure your package includes sufficient tickets for all your attendees. You will need to purchase additional tickets if required. Don't hesitate to contact us if you have any questions about this. You need to send or bring any materials, such as banners, that you wish to display or use, and arrange for their collection and return after the event. Except for Platinum or Headline sponsors, your pop-up banners need to be such that they can be safely displayed behind or at the side of your booth space, as in the photograph below, or against a wall. space behind or to one side for banners. Platinum sponsors may bring their own, larger, booth equipment. 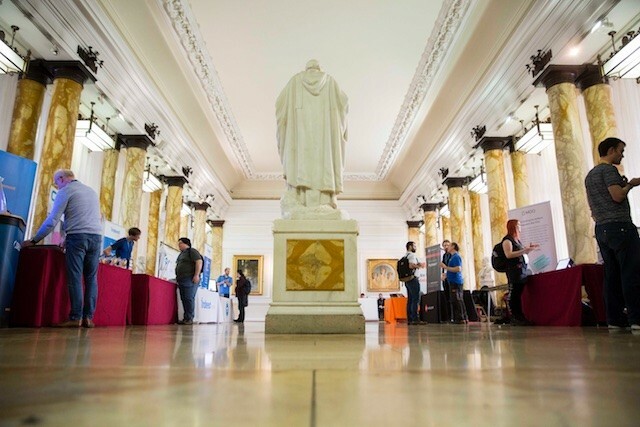 You may set up your stand the afternoon or evening before the conference (Thursday 12th September, until 20.00). If you prefer, access on the morning of Friday 13th will be available from 08.00.